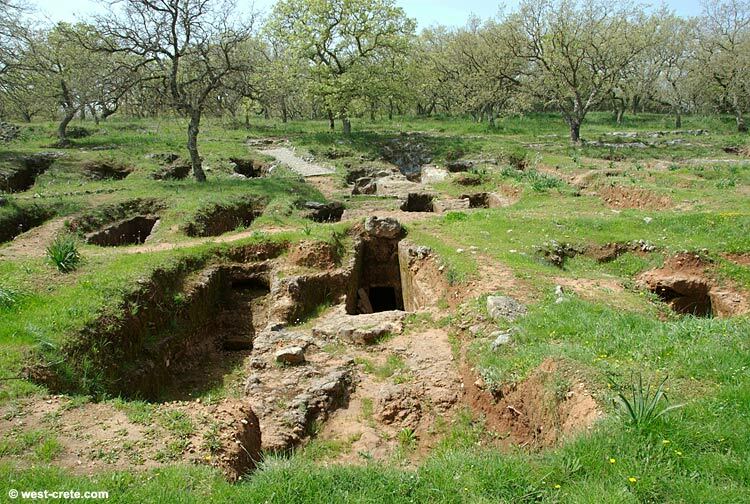 Researchers at the University of Huddersfield have visited Rethymnon in Crete, to collect samples from the late Bronze Age Necropolis of Armenoi, one of the world’s finest archaeological sites. DNA analysis of the ancient skeletal remains could provide fresh insights into the origins of European civilisation. Researchers at the University of Huddersfield have visited Rethymnon in Crete, to collect samples from the late Bronze Age Necropolis of Armenoi, one of the world's finest archaeological sites. DNA analysis of the ancient skeletal remains could provide fresh insights into the origins of European civilisation. Dr Ceiridwen Edwards and PhD student George Foody were permitted to take bone samples and teeth from over 110 of the more than 600 skeletons discovered in the Necropolis, a rock-hewn burial site from the Late Minoan period dating to more than 4,000 years ago. During their two-week visit, the Huddersfield researchers – part of a team that included colleagues from Oxford University and the Hellenic Archaeological Research Foundation – also took DNA swabs from more than 100 contemporary Cretans. They sought people whose grandmothers were from Crete in order to analyse links to the Minoan period. When the ancient DNA samples are compared with those of modern Cretans, there is the potential to find solutions to many issues surrounding the ancient migration of people and culture to an island where the Bronze Age Minoans and their successors the Mycenaeans laid foundations for later European civilisation and culture. "The Minoans are one of Europe's earliest civilisations and research will affect the interpretation of a number of fields – archaeological, historical and social," said George Foody. For example, fresh light could be thrown on the migration of the Mycenaeans to Crete, and on the origins of the early script known as Linear B. Also, the DNA analysis might establish family relationships between the occupants of the tombs, and it might be possible to establish the presence of a high status dynasty. "We are trying to establish family relationships within the necropolis itself, as well as see how the site compares to other Minoan sites, and compare it to sites in mainland Greece," added Mr Foody. His PhD supervisor, Dr Edwards, is Senior Research Fellow in Archaeogenetics at the University of Huddersfield, which is home to the University's Archaeogenetics Research Group. It has fully-equipped modern and ancient DNA lab facilities and studies the geographic distribution of human genetic variation, aiming to address questions from archaeology, anthropology and history. The Research Group is the recipient of a £1 million award by the Leverhulme Trust, under its Doctoral Scholarships scheme, which will train 15 new evolutionary geneticists. George Foody, from Cork in Ireland, is one of the second cohort of doctoral trainees, and his visit to Crete was part-funded by the Leverhulme Award. His PhD thesis will focus on the results of this research. While the Huddersfield duo and their colleagues were in Crete, there was considerable local media interest, including TV coverage. During her research career, Dr Edwards has studied DNA of archaeological samples from many species, including giant Irish deer, domestic horse, wild boar, domestic pig, brown bear, and red deer, dating from 1,000 to 40,000 years ago. Her speciality has been the study of aurochs, the ancestors of domestic cattle, as well as ancient cattle breeds.